welcomed the next generation of food industry specialists as part of Boston High School’s Challenge Week. During the week-long agri-food industry research project, year 10 and 12 pupils were encouraged to find out more about the employment opportunities and pathways into the food industry in Boston. Nineteen staff and students, from the aptly named Business Boston team, were welcomed to the Freshtime site on Marsh Lane by Managing Director Steve Evans. “We’re a big employer in Boston but we’ve found in the past that younger people aren’t always sure how to go about becoming part of our team,” said Steve. The group also met HR Manager Jo Campling, who talked to them about key areas of the business, and Factory Manager Sarah Green who explained how Freshtime develops new products. 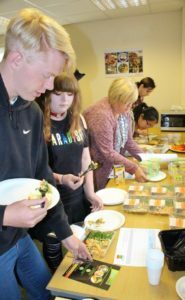 Sarah also invited the students to take part in a taste panel and assess a range of fresh food-to-go products on their appearance, texture and taste. The students were complimentary about the products, which are available in supermarkets and restaurants nationwide. Ann Bell, Director of Community and Challenge Projects at Boston High School, said: “The Business Boston group really enjoyed their session at Freshtime. The pupils finished off the week by delivering presentations at the school on Friday 30th June on everything they learnt during their visit. 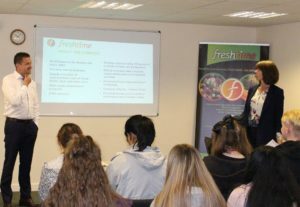 Jo said: “It was great to talk with the pupils about the business and invite a number of the Freshtime team to share their routes to employment with us and their career progression as part of our team. “As well as a graduate training programme, we also offer apprenticeships and are keen to help talented and ambitious team members achieve their career goals.